This salad is fast becoming one of my favourites! It makes a gorgeous starter or light lunch, successfully combining the soft crunch of lime-drenched strands of courgette with a subtle, silky dressing made with avocado, garlic and basil. 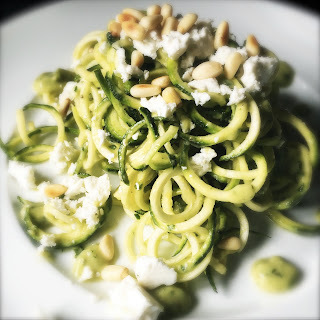 Finally, the salty crumble of feta and the toasted bite of pine kernels finish this dish to perfection. It's best made just before serving otherwise it will go soggy. 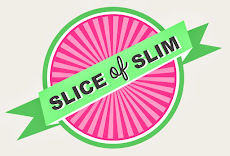 Squeeze the lime and pop the juice into a large bowl, reserving a little for the dressing. 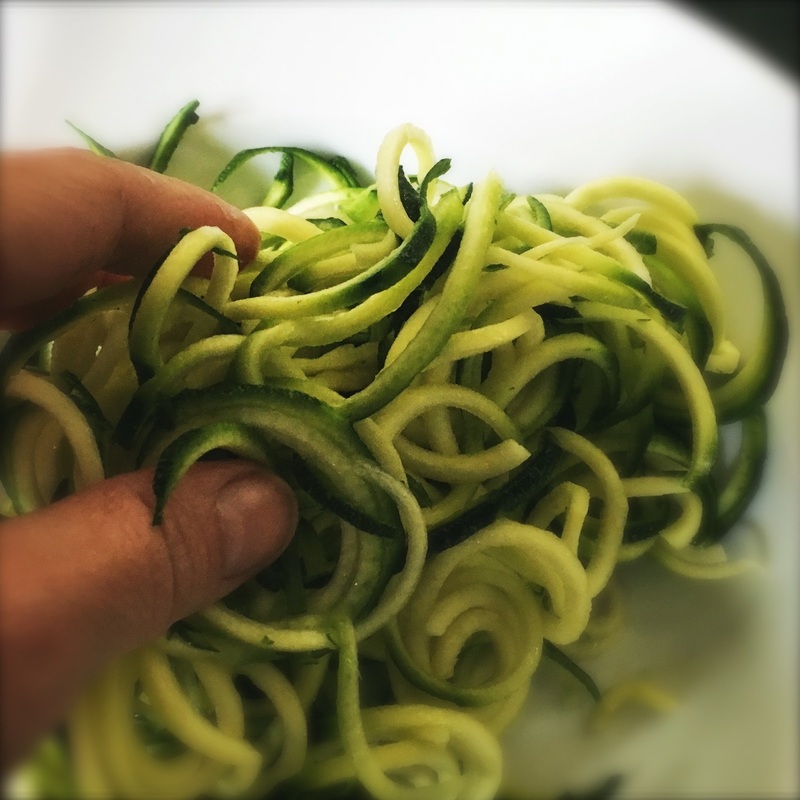 Spiralize the courgette and mix well by hand into the lime juice to coat thoroughly. 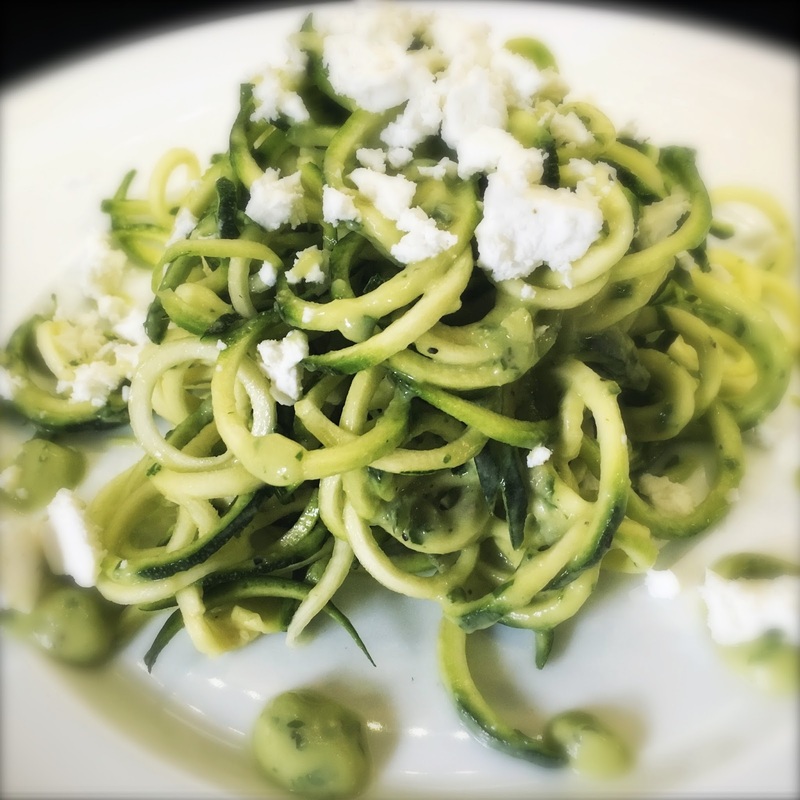 This will slightly 'cure' and soften the raw courgette strands and infuse them with flavour. 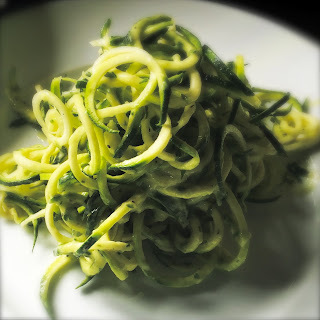 Pop the avocado, garlic puree, the remaining lime juice and basil leaves into a food processor. The lime juice is just to stop the avocado from discolouring. Blend the dressing ingredients, adding cold water a few tablespoons at a time until you have this beautiful creamy, thick, silky-smooth dressing. It should drop easily from a spoon but not be too runny. It's amazing how much water this dressing can take! Season with black pepper. Add a little more garlic puree if you feel it's necessary but remember it will be mixed with the lime-drenched courgette so all the flavours will come together. 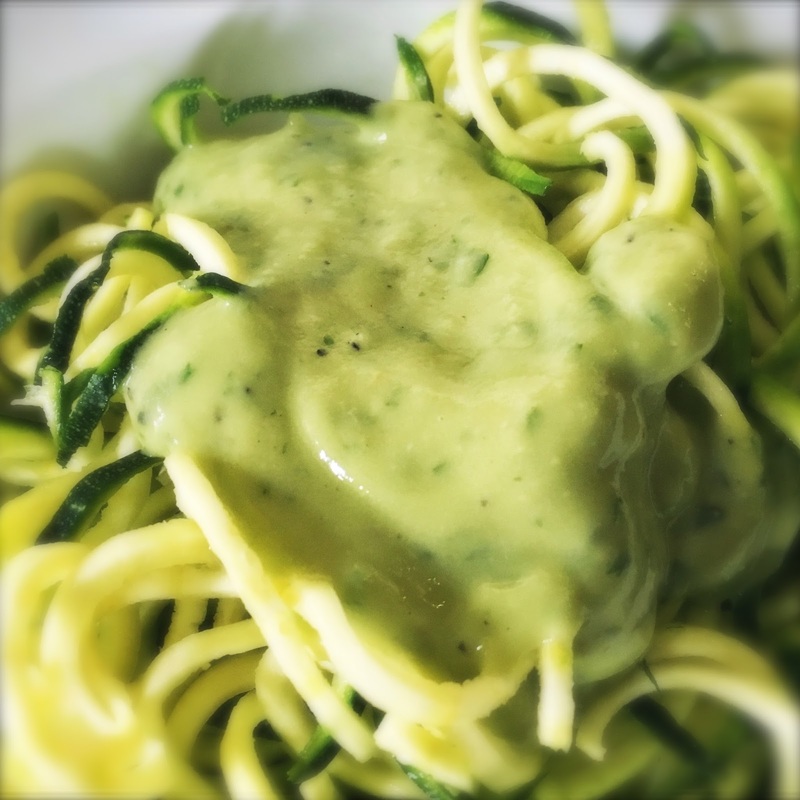 Pour the dressing onto the courgette strands saving a little amount to drizzle onto the plates when serving. Mix well to coat everything thoroughly. Divide the mixture into 4 portions and heap generously onto serving plates. 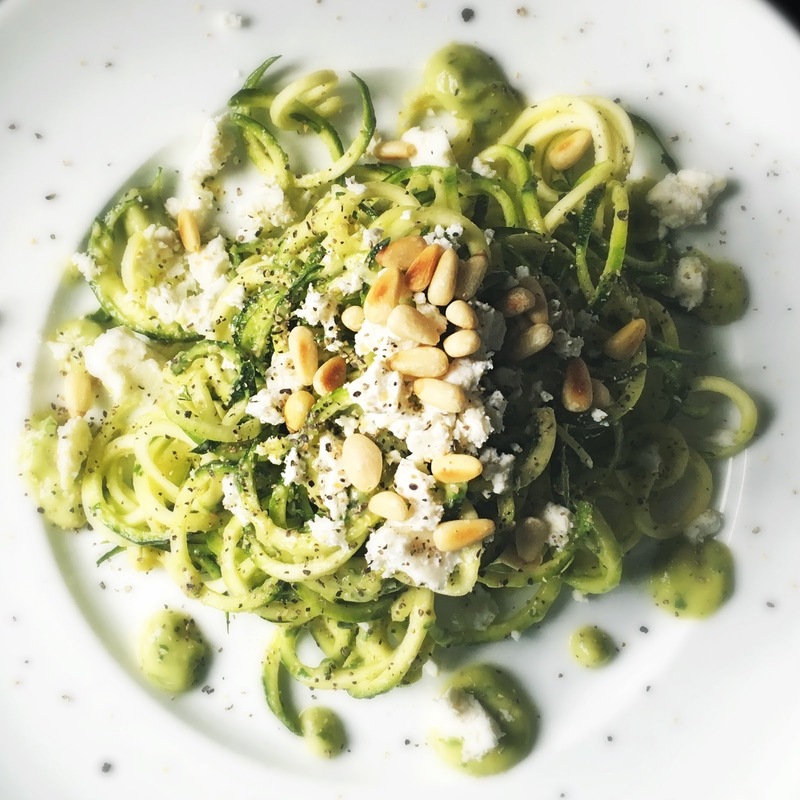 Dot each plate with random blobs of dressing then divide the reduced fat feta into 4 portions and crumble loosely on top of the courgette. Finally, divide the toasted pine nuts equally and scatter on the top of the salad. Finish with a little freshly ground black pepper. 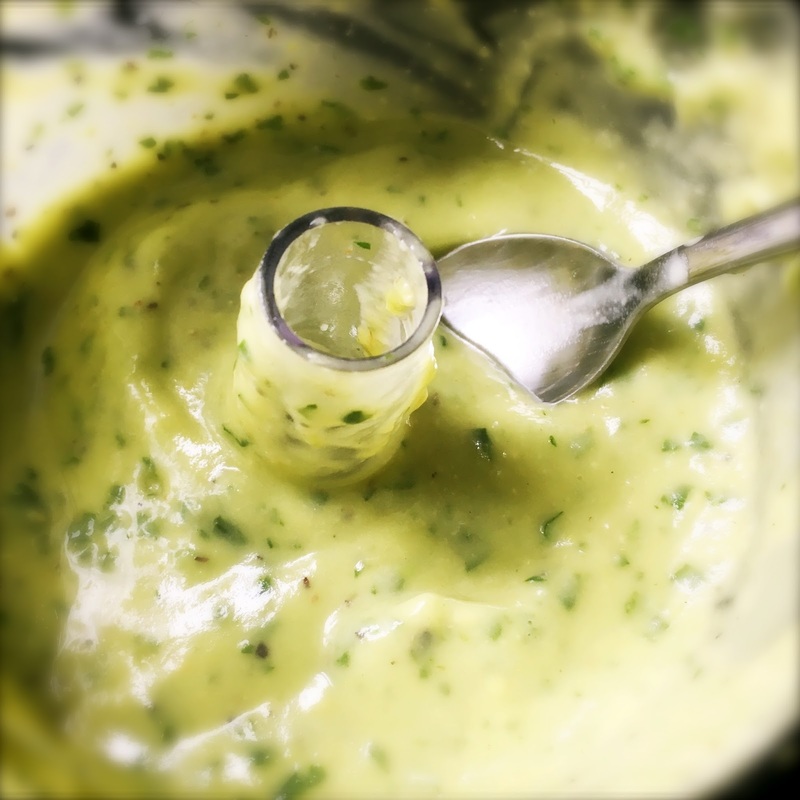 The avocado salad dressing is gorgeous on any salad of your choice-green leafy, pasta, etc. It works out to 11sp/190kcal for the whole amount or 3sp/48kcal per portion.